Weather has been nice is a series of video installations in which vintage found postcards, are projected onto large panels of plexiglass, becoming vessels of these images. With their exaggerated colors and iconic images, these commoditized stereotypical landscapes are non-places that are at the same time unknown and familiar. The images seem static but slowly lunge into an inner movement. 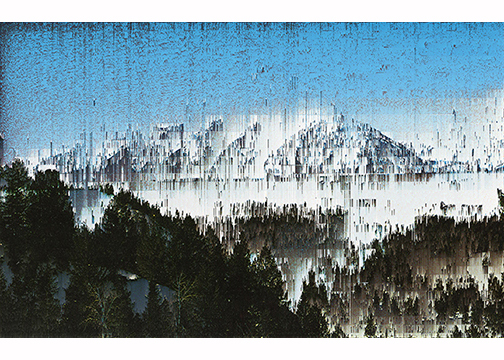 Through a pixel sorting algorithmic manipulation process the images are slowly decomposed, melting into their own components; like an autopoietic system that produces the components which through their interactions and transformations continuously regenerate and realize the network of processes that produced it. Weather has been nice presents us with images unfolding, becoming images. In so doing, they question the sense of place and sublime nature of landscapes, representing the paradox of memory and experience – our underlying propensity to arrest time and the dynamic nature perception. By appreciating these postcards, not as the penultimate view of a place, but as an instant that unfolds, the work alters our relationship with these images, mediating an awareness of ourselves as producers of landscapes and not merely consumers of them. The installation consists on a variable number of large double-sided transparent plexiglass panels floating in the space, suspended from the ceiling. Different ‘decomposing’ vintage found postcards are projected onto a translucent film contained in each panel, allowing the image to be seen from both faces (front and back). Each image is being processed in real time by a custom made pixel sorting application that varies in speed every time it resets. The panels are hanged creating an in/out spatial configuration that allows the viewer to experience the piece either in an immersive manner, surrounded by the subtle transformation of the image, or as an observer gazing at a constantly changing landscape. In both cases, the image manipulation creates a contemplative state that refers not only to an external landscape, but also to an inner state of transformation. Installation view at Dumbo Arts Festival 2014. 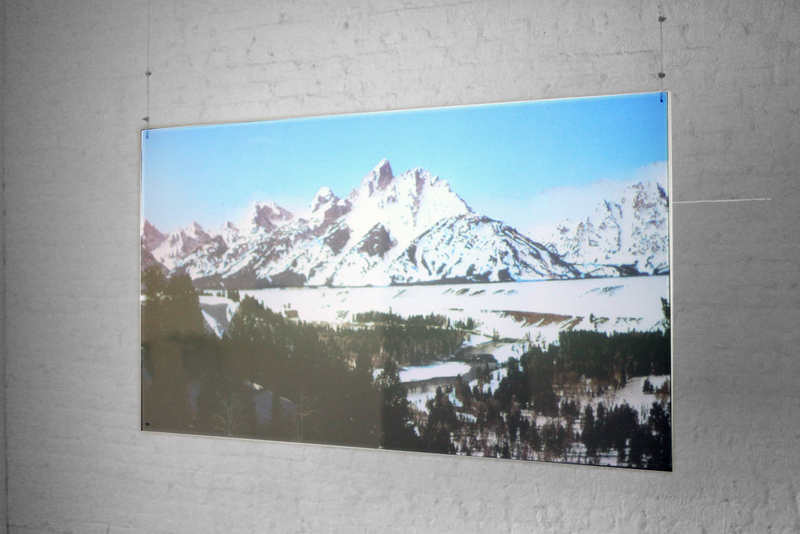 Weather has been nice, 2014, video installation, found vintage postcards, two 8x5 ft double sided plexiglass panels, translucent film, custom made pixel sorting application. Installation view at Dumbo Arts Festival 2014.